Celebrate the fact that spring has sprung with some fresh watercress, which is just coming into season. If goat’s cheese is not your thing, a good cheddar or blue will work just as well. The most important thing to get right with a tart is the pastry – too often it’s soggy and the ruin of any good filling. You will need a tart ring of around 8in in diameter – use one with a loose bottom, or put it on a baking tray. Roll the pastry out to overlap the edges of the tin. Blind bake the pastry – prick the base with a fork, add some baking beans (or dried pulses or rice) to preserve the shape. Bake for 15 minutes at 180ºC. Remove the baking beans and cook the pastry for a further five minutes, until golden brown, then allow to cool. Beat the eggs and cream together and season. Steam the watercress to wilt it, dice the cheese roughly, then scatter both around the tart base and pour over enough of the egg mix to cover (we’re binding the filling, not aiming for an eggy tart). Bake in the oven at 180ºC for 15-20 minutes until set. Allow to cool, trim the excess pastry and serve with a green salad. • Angela Hartnett is chef patron at Murano restaurant and consults at the Whitechapel Gallery and Dining Room, London. 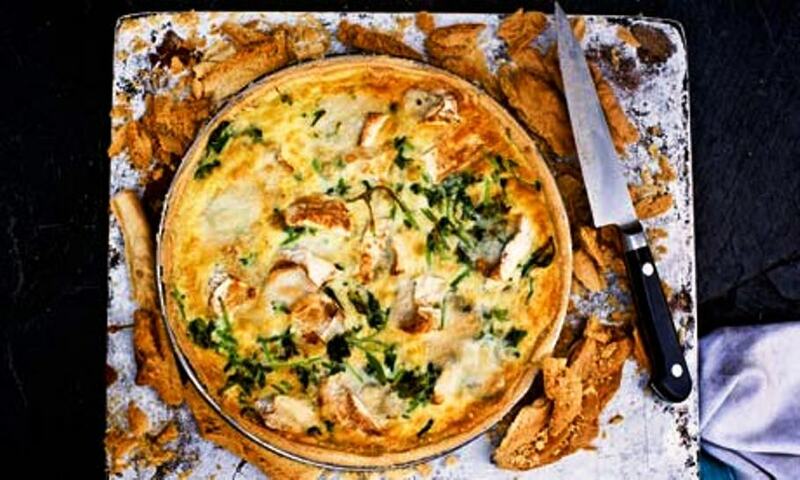 This entry was posted on April 16, 2012 at 5:29 pm and is filed under Food with tags angela hartnett, chefs, double cream, eggs, goat’s cheese, guardian, london, murano, pepper, recipes, salt, shortcrust pastry, supper, uk, watercress, whitechapel gallery. You can follow any responses to this entry through the RSS 2.0 feed. You can leave a response, or trackback from your own site. thanks for sharing this – this sort of thing is right up my street.